A gas flare at a natural gas processing facility in North Dakota. 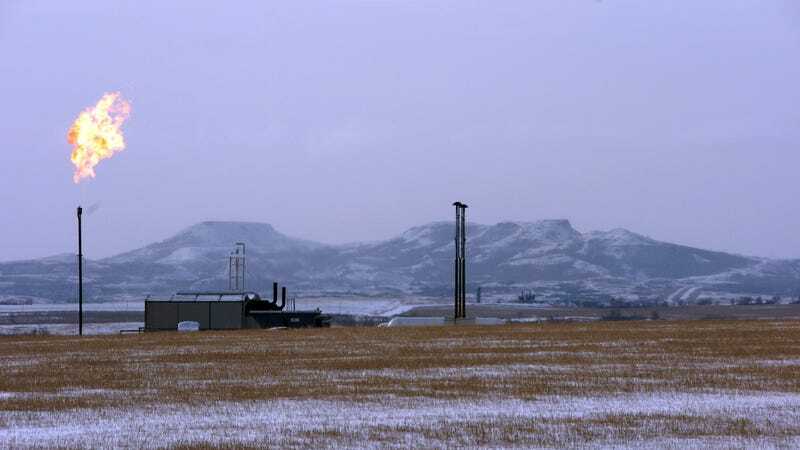 Specifically, the proposed changes on methane leaks allow companies that are currently required to perform inspections every six months to only do so once a year, or up to two years for “low-producing wells.” Equipment that traps and compresses the gases would also only need to be examined every six months instead of three, the Times added, and only once a year in parts of rural Alaska. It also doubles the time limit on repairs from detected leaks from 30 to 60 days. Environmental activists contest repealing the separate methane venting and flaring rules would return the U.S. to a 40-year-old regulatory regime. Per the Denver Post, it’s not currently known how much methane is recaptured by leak repairs. But after Colorado officials implemented a stronger oil field inspection program in 2015, methane leaks fell by 52 percent over a two-year period and energy firms repaired 73,000 leaks. A study in June also showed that methane leaks are widespread enough to offset most of the climate benefits of burning natural gas instead of coal. In other words, these are important rules. But if the Trump administration’s proposal passes, not only will companies in states with less stringent rules face less oversight of their unintentional methane leaks, they’ll be able to intentionally vent more of the methane itself and the black carbon byproducts of flaring into the sky. Keep in mind that venting and flaring are sometimes used as a safety precaution, but also happen when oil well operators are pumping too much methane out alongside the oil and just want to get rid of it. As the paper noted, this all follows on proposals from the Republican-controlled EPA to roll back tighter fuel economy standards and allow far more emissions from coal-fired power plants. It’s also another sign that Andrew Wheeler, the former coal lobbyist who took over the EPA after the departure of scandal-ridden clown Scott Pruitt and quickly gutted coal ash regulations, is continuing to move forward with his predecessor’s mission of undermining the agency’s regulatory power. Kathleen Sgamma of oil and gas industry association Western Energy Alliance, however, did comment. She told the Times the methane rule rollbacks were a “near pair” of proposals. That’s probably because, as the paper noted, the changes are estimated to save her industry somewhere in the neighborhood of half a billion dollars by 2025. Just ignore that the rest of us will have to pay for those savings in spades and start chanting about jobs or something.